Sparkhouse is proud to be a part of the 4th Annual Forge54 skilled giving weekend. 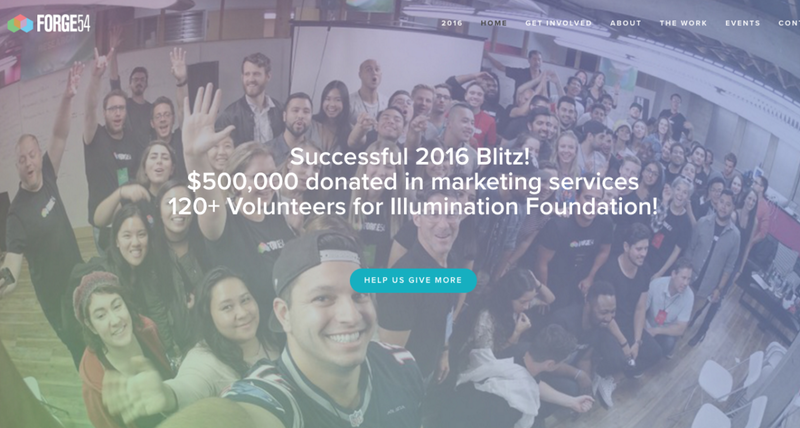 We had our biggest year yet, with over 120 volunteers donating more than $500,000 in marketing services to Illumination Foundation. A lot happened in 54 hours. Our volunteers consumed 1200 meals, 540 cups of coffee, 130 energy drinks, and 240 beers. Oh, and they completed an insane number of projects! The projects were divided among teams covering internal marketing, events, social media, design, messaging, public relations, photography, video, digital, and mobile. Coming from more than twenty agencies and fifteen schools, our teams worked together as one to make a huge difference for Illumination Foundation. This year the OC Register reported on all the great things our volunteers were doing in a front-page story! We would like to give a big “thank you” to the OC Register, our sponsors, and our volunteers. As always, video played a big role at Forge54. The Sparkhouse team jumped in to help contribute, with our own director, John Nasteff, leading the video team and directing the Illumination Foundation PSA. If you are interested in supporting or volunteering at next year’s Forge54, please check out our website at www.forge54.com. Or even better, come out to one of our monthly ForgeConnect events held on the last Thursday of every month. See you there!